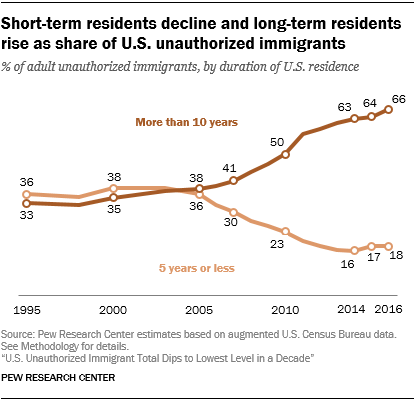 Long-term unauthorized immigrant adults are no longer the exception and have become a decided majority of this population in the years since 2007. In 2016, about two-thirds of unauthorized immigrant adults had lived in the U.S. for more than a decade, and the share has risen from less than half (41%) in 2007. Only 18% have lived in the U.S. for five years or less, a decline from 30% in 2007. Mexican unauthorized immigrant adults are among the most likely to be long-term U.S. residents: In 2016, eight-in-ten had lived in the U.S. for more than 10 years. In fact, the typical unauthorized Mexican immigrant adult has lived in the U.S. for nearly 17 years. A relatively low share of Mexican unauthorized immigrant adults – 8% – have lived in the U.S. for five years or less. That is consistent with both the decline in apprehensions of Mexicans at the U.S. border and the decreased share of Mexicans among recently arrived unauthorized immigrants. Majorities of unauthorized immigrant adults from other Latin American nations also have lived in the U.S. for more than 10 years. They include about two-thirds of unauthorized immigrant adults from Central America and nearly six-in-ten from South America. Asian nations as a group are more evenly balanced between long- and short-term unauthorized immigrant adults, with nearly four-in-ten living in the U.S. for more than a decade and three-in-ten for five years or less. Nations in the Middle East and North Africa have higher shares of unauthorized immigrant adults in the U.S. for five years or less (50%) than for more than 10 years (32%). As of 2016, the typical unauthorized immigrant adult had lived in the U.S. for nearly 15 years – that is, half had lived in the U.S. for longer and half for less time. That compares with a median of less than nine years in 2007.